The International Space Station will be capable of dozens of new scientific investigations from NASA and around the world when Orbital ATK’s Cygnus spacecraft delivers more than 7,600 pounds of cargo Saturday, April 22. 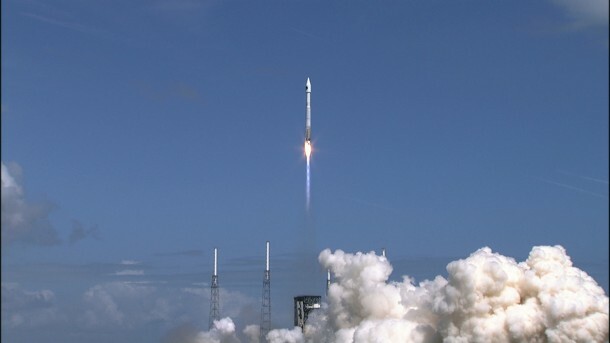 Orbital ATK’s seventh cargo delivery flight to the station launched at 11:11 a.m. EDT Tuesday on a United Launch Alliance Atlas V rocket from Space Launch Complex 41 on Cape Canaveral Air Force Station in Florida. Expedition 51 astronauts Thomas Pesquet of ESA (European Space Agency) and Peggy Whitson of NASA will use the space station’s robotic arm to grapple Cygnus, about 6:05 a.m. Saturday. The spacecraft will remain at the space station until July before its destructive reentry into Earth’s atmosphere, disposing of several thousand pounds of trash. This is the fourth flight of an enhanced Cygnus spacecraft, and the third using the Atlas V launch system. The spacecraft for this mission is named in honor of John Glenn, the first American to orbit Earth. Glenn, who died in December at age 95, was one of NASA’s original seven astronauts and a retired U.S. Senator from Ohio. The mission, which is under NASA’s Commercial Resupply Services contract, will support dozens of new and existing investigations as Expeditions 51 and 52 contribute to approximately 250 science and research studies. Highlights from the new experiments will include studies on cancer-fighting drugs, crystal growth and atmospheric reentry. In microgravity, cancer cells grow in 3-D, spheroid structures that closely resemble their form in the human body, enabling better tests for drug the efficacy. The ADCs in Microgravity investigation tests drugs designed as targeted cancer therapies called antibody-drug conjugates, developed by Oncolinx. These conjugates combine an immune-activating drug with antibodies and target only cancer cells, which could potentially increase the effectiveness of chemotherapy and reduce side-effects. Results from this investigation could help inform treatments for cancer patients and provide insight into how microgravity affects a drug’s performance. The Solidification Using a Baffle in Sealed Ampoules (SUBSA) investigation originally was operated successfully aboard the station in 2002. Updated software, data acquisition, high definition video and communication interfaces will help advance understanding of the processes involved in semiconductor crystal growth. Investigations such as the CLYC Crystal Growth experiment will be conducted in the SUBSA Furnace and inserts. High-quality crystals are essential to a variety of applications, and a microgravity environment can produce better quality crystals. CLYC crystals grown aboard station can help researchers understand the exact conditions needed to produce the highest-quality, defect-free crystals.